This is my new baby, Sasha, we have had her for 3 weeks now and just adore her!! She has a fantastic nature and has already accepted my children (one at 6 months the other is 5) as her family! Sasha is our first GSD and I would recommend the breed to any young family! She has a terrible habit of mouthing! We have tried a selection of different toys however she seems more content to chew mine and my partners hands! She never mouths the children yet can't seem to play with my partner or I without mouthing! My Acer was mouthy and what I did was to catch him when his mouth was full on my wrist and I squealed very very loud, like a hurt puppy or something. He has never put his mouth on anyone,on purpose that is, again. Good luck with your wonderful baby! Well that is Sasha nearly 5 months and roughly 15/17 kg she is doin great!! She still mouths our wrists every now and again but we have just been replacing our hands with a toy and it seems to help! She has already taken to following us everywhere especially my little boy she is joined at the hip with him!!! Even off leash she will never stray!! I am on my phone unfortunately and can't upload a picture but as with all GSD Sasha is gorgeous! First let me congratulate on your new edition to the family! I wish there was a picture of your precious baby, I bet she is Adorable! Mia my beautiful German Shepherd does the same thing too, she likes to mouth on our wrist/hand, she has done this she was a pup, she is over 2 yrs, I dom't want her to do it others and I correct her but my husband heard it's a German Shepherd thing, I don't about that. The puppy year - I love it, teaching, training and bonding. 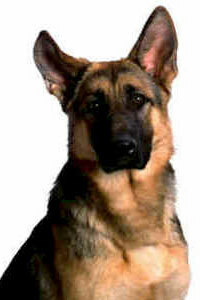 She will become your Protector it is the way German Shepherds are; it is in their blood. Mia protects and she is by our side all the time. Take care of your girl Sasha and she will take of you! I will be interested to hear what advice others give you, because we are getting pretty mouthy behavior from our Jenny.